SEMMco designs, develops, builds and installs machines for chocolate processing. We build moulding, enrobing, tempering and spinning machines, including all peripheral equipment. SEMMco has everything in-house to automate your entire production process and to answer with a tailor made solution. Referring to manufacturing the handmade chocolate processing machinery, there is no doubt that SEMMco is best qualified to speak. It is the sino-british joint venture invested by HERON and KEYCHOC. SEMMco is also the exclusive distributor for GAMI Srl in China. GAMI is an Italian company and is a leading manufacturer of continuous tempering machines for chocolate. Their aim is always to put their customer’s needs first and determined to forge ahead all the time. They adhere the principle ”customer first” to provide better service for their customers.Their products are exported to Southeast Asia, Europe and American and other countries and regions. SEMMco is truly the powerful enterprises. Its products include mini chocolate holding tank, ZDT Series vibrating table, MM Series chocolate moulding and enrobing machine, LD Series cooling tunnel, TWG Series chocolate tempering tank, T6 chocolate tempering machine, New TWG Series chocolate tempering tank, chocolate coating machine, BWG Series chocolate melting and holding tank, chocolate melting tank, pure chocolate tempering and enrobing machine, polishing tank, automatic candy bar line, chocolate continuous tempering machine, chocolate one-shot depositing machine and so on. The mini chocolate melting tank, made of stainless steel, is an ideal device for melting or storing a small amount of chocolate and control a small amount of chocolate in the desired temperature. The ZDT Vibrating Table is usually used during the process of chocolate forming. It can remove air bubbles from liquid slurry, and also can be used to make the mold hollow or nut shell. The MM Chocolate Moulding Machine is very light and easy to carry. It is made of all 3-4 stainless steel with variable speed gear and digital temperature control. 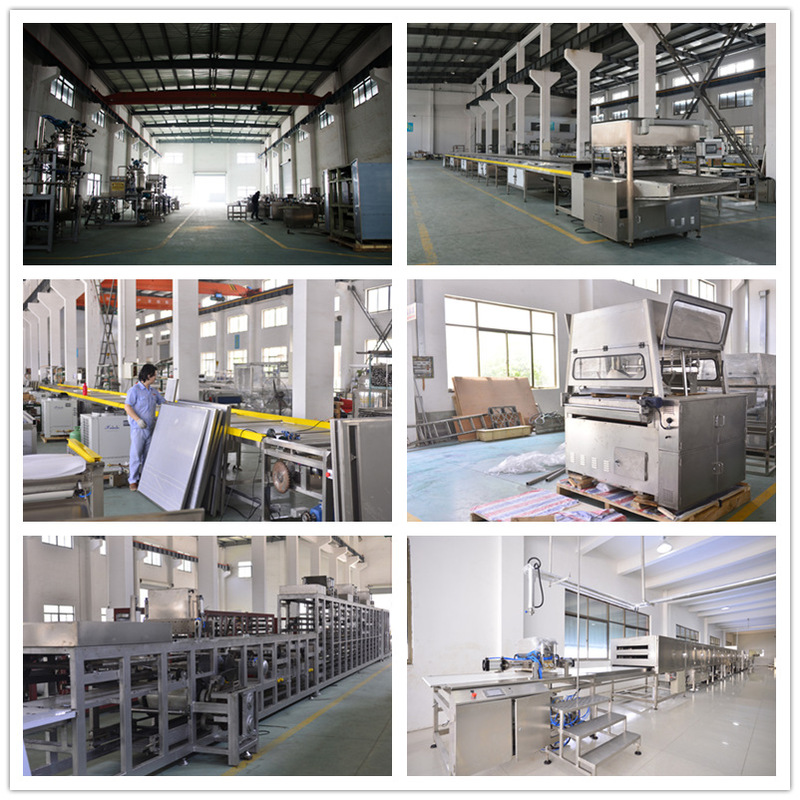 MM series casting coating machine can be equipped with coating belt, which is suitable for nut and pastry products, from biscuits to cakes. The entire coating process requires only one operator, which can easily be exported from the coating area to the product. LD series of cooling tunnel, applicable range from small low thermal products to large high temperature products, with the highest performance of convection and radiation cooling, can satisfy any customer’s special requirements. The TWG series Chocolate Tempering Tank can be used for the mixing of more viscous liquid, which can stir and control the temperature quickly, accurately and continuously. The T6 Chocolate Tempering Machine, with the gas cooling system through the refrigeration compressor, makes solid melting stage to cooling temperature stage perform an automatic temperature adjustment. Also it equips with flow control pedals, which makes chocolate production more convenient.